On the journey to find a replacement for my now discontinued HG Alba Botanica Volumizing Conditioner (*sigh* they just have to dc the unicorn product for my hair), I tried Giovanni Root 66 Max Volume Conditioner. While it's really thick, makes my hair feels likes silk and lathers really well as co-wash (I need much less product with this conditioner), I found that it flattens my roots and doesn't give me good clumping. It makes my hair way too soft and despite the amount of jelly I used, I barely got any hold. I thought it was just my recently reformulated DIY Okra Jelly, but when I tried the jelly again with AB Volumizing Conditioner, the great clumping and hold returned although my roots stayed flat since I just cowashed and didn't clarify (I suspected it was the Poly-7 that wrecked havoc on my hair). I was going to try 50:50 Balanced-Hydrating and Tea Tree Triple Treat conditioners, but now hesitated due to Root 66 letdown. Should I still give them a try considering that they have guar hydroxypropyltrimonium chloride and oil (thus potentially heavier)? My hair didn't like much ghpc in the past and for something I have to fuss ordering online, if it's any heavier than Root 66, I'd rather not. Would appreciate your advice. And my hair's properties are in my siggy. TIA! I actually like the Giovanni Smooth as Silk line even though my hair is super-fine. It doesn't weigh it down as long as I'm careful to keep the conditioner off the roots. I've Tried the TTT (conditioner only) and I find I still like the SAS the best. My hair is baby fine and color treated. I've never tried the Root 66, though. I shampoo with the SAS poo and follow with the SAS conditioner, mainly keeping off the roots, though. I concentrate most of my conditioning from the top of ears down, otherwise I get a flat look. Usually when I use those I follow up with the Giovanni More Body thickening gel. The three seem to work best together for me. I really think you have type 3 hair. It's very pretty, but curlier than a type 2. I've found that when my jelly doesn't give me hold, I am in need of protein. I'd try the Smooth as Silk. I've only used it once and it made me itchy, so can't say how well/not well it works. Are you referring to my hair in the ID photo? That was one of many rare days for my hair. I think it was also due to the cut I had at the time. I've never managed to get my hair that curly anymore. Even if I coax it a lot, it's a somewhat lazy 3a at best. 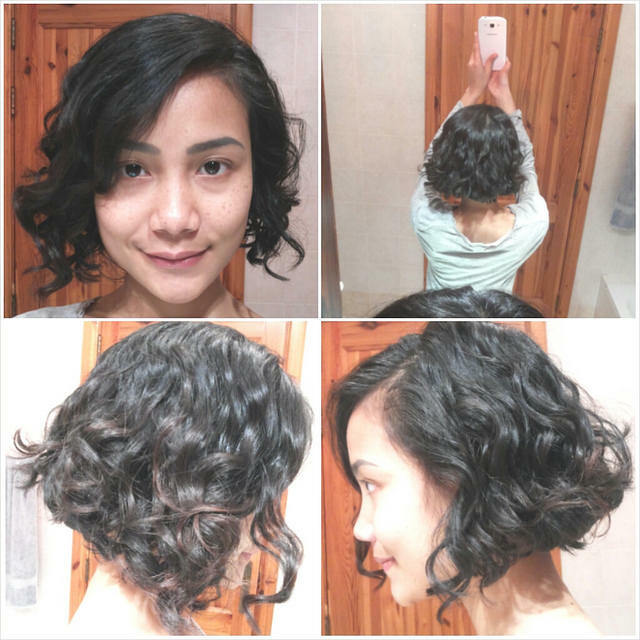 I can plop to get stronger pattern, but that totally kills any volume on my little hair. I attached the picture of what my hair looks like nowadays. Such a cute haircut! Where did you get it done? I got my haircut in a local salon here (I live in Malta). The hairdresser's a friend of mine and she has curly hair herself (3b), so I broke my longterm resolution of only getting haircut with my trusted-for-years hairdresser back home. She cuts my hair wet and brushed, but it always turns out great! I use the 50 50 conditioner regularly, and I do like it. It doesn't over condition my hair but gives it enough. I use it often for sure. It detangles pretty well too.